In 72 hours I will be sitting in The Works space at Washington High School - halfway through the T:BA11 performance by Mike Daisey. Halfway through the 24-hour monologue. All the Hours of the Day. 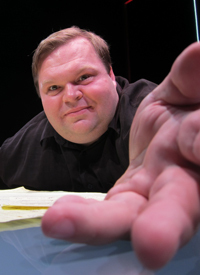 We wanted to give you some tips about how to make the most of your audience experience at the upcoming 24-hour Mike Daisey performance, All the Hours in the Day. There will be interludes in the performance, during which you will be able to freely move around, exit the theater, and come back. We will have food, coffee, and water available for purchase at all times. The TBA Closing Night Dinner will be served after the show at 6:30 pm Sunday. We will be sharing Neopolitan-style pizza, salad, and wine. Tickets are $15 for members and $20 general. You must purchase a ticket to the dinner in advance. Please join us! We will have the bars open starting at 5pm on Saturday, so you can come early and have a drink with us in the beer garden and buy some food. Alcohol will not be allowed in the theater. Audience members who are under the age of 21 must watch the performance from the balcony due to OLCC policy (until at least 2am). The balcony has some great views to the stage. The theater is very old and the seats are made of wood. Don’t forget your pillow, cushion, neck pillow, and blankets. Other necessities that you might want to bring: contact solution, toothbrush and toothpaste, a sweater…think of what you might take with you on an international flight. We’ll be crossing time zones! This is going to be an adventure. We will be there with you through it all. See you at the theater!